The Daily Kirby: GIVING KIRBY HIS DUE? 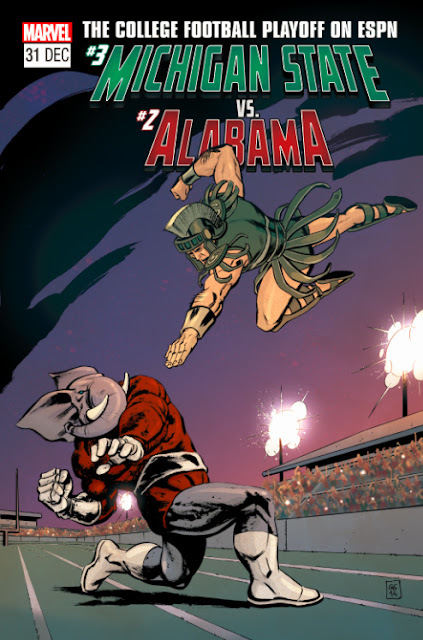 The Oklahoma Sooners take on the Clemson Tigers today and Marvel released an image of the teams fighting it out comic-book style. The cover, which features a Clemson Tiger facing off against an OU pony (Boomer or Sooner, presumably), is a visual homage to Mike Zeck's cover for Captain America Annual #8, which featured Wolverine and Captain America. A cover was also released showing Michigan State and Alabama mascots battling; that cover is an homage to Jack Kirby's cover for Silver Surfer #4, which featured the Silver Surfer facing off against Thor. While Kirby created the Silver Surfer and co-created Thor, the cover of Silver Surfer #4 was by John and Sal Buscema.